Block-N-Roll® is a multiple award-winning toy that combines the fun of building blocks with the challenge of building marble mazes. Use the blocks in a traditional manner to create buildings and towers. Or use them to create elaborate marble mazes that are limited only by your imagination! Challenge your friends to build the fastest or tallest marble maze. Create angles for speed. Turn a marble around in the other direction. 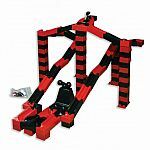 Block-N-Roll offers hundreds of building options to create plenty of marble maze action with dropping, tunneling, ramps, cross-overs, and turns. Not only is it fun, but educational. It encourages creativity, manipulative skills and social play while stimulating strategic thinking. Block-N-Roll is also the only patented horizontally integrated marble maze. Simply put, these blocks attach together on the sides as well as on the top and bottom. Plus, they work seamlessly with all leading plastic building blocks. All the marble maze sets work together, so you can grow your marble mazes as your imagination grows.